Did you see the cover? Go back and look at it. That cover, alone, will queue up the kids and nearly bring them to fisticuffs to be the first to get their hands on it. The very mention of a shark comic sent several of them into a tizzy. I have a list of younglings from grades 1-4 who have asked me to set it aside for them. That’s before they saw the cover art. 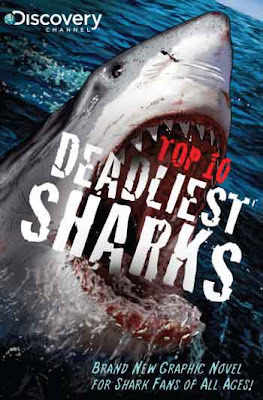 The guts of the book –– from the blood-clouded waters and half-eaten limbs, to the specific shark stats and the importance of apex predators to the aquatic biome –– DISCOVERY CHANNEL’S TOP 10 DEADLIES SHARKS is a kid-tween (even young teen) page-turning comic of coolness. It’s science done right for kids. SHARKS differs starkly from other nonfiction comics in one significant way: It employs nonfiction in its totality. That is to say, SHARKS does not intermingle fictionalized narrative around nonfiction. The other nonfiction comics I’ve read and reviewed use science or history as a foundation, but use a fictionalized narrative to get the information across to the reader. There is a fictional narrator who escorts the reader through the science, history or biography. That narrator imparts knowledge and (sometimes) speaks directly to the reader. In the case of SHARKS, there is no fictionalized narrator-character leading the reader; instead, there are third person omniscient narration boxes. Except for one or two instances, there are no dialogue bubbles. This makes SHARKS read like a Discovery Channel show. There are tons of informational ah-ha moments. There are comicized reenactments of actual events –– which do on occasion lead to dialogue –– but every scene, every tidbit, every single moment of the story is authentic nonfiction. I did have two concerns about the book when I requested it: 1) The number of human-munching incidents by sharks gave me pause that the book might over sensationalize the actual threat sharks pose to humans; and 2) the ability to differentiate the sharks enough so students can keep them all straight. As it came from Discovery Channel, I had high hopes these would not be issues. Discovery Channel got it right. In fact, I highly recommend the comic because of Discovery Channel’s portrayal of human-shark interaction. Actual shark attacks of humans are explored, as are incidents of humans hunting sharks. More importantly, Discovery does two things for students: 1) Students understand that while shark attacks occur, they are rare as humans are not on the regular shark menu of choice; and 2) sharks are apex predators which play a vital role to the health of Earth’s aquatic ecosystems. Without sharks, many ocean biomes would fall apart. Helping students understand the role that every organism plays, from the spider to the shark, helps them understand how to protect the environment and our own health and longevity on this planet. In case that is much too heavy for you or your students … there is plenty of shark-chomping bloodlust to satisfy any young boy who has otherwise lost his motivation for reading. I’ve said many times one place I think the education industry misses the boat is that we focus our efforts so much on reading skills that we often –– unintentionally –– educate the love of reading out of students. It’s not on purpose. It is with love and concern that we push reading skills because good reading skills are necessary to successful reading. Sometimes we teachers can forget the importance motivation or love of reading plays in a child’s future reading habits. We must, I believe, cultivate a passion for reading. With motivation fertilized, reading instruction can do amazing things. DISCOVERY CHANNEL’S TOP 10 DEADLIEST SHARKS is a bang-up reading motivator or reading love instigator, especially for boys who consistently fall behind girls in reading in every single state in the US. Put this book in your classroom and you will find that one copy will not do. This book will appeal to young readers. They will be fine if an older reader will scaffold them. There are some big words and concepts in it. That’s a good thing. This is a book that kids will want to read even if it challenges them. I would not limit the book to any age group, to be honest. If a student were interested in it, I would give it to them and offer them the proper scaffolding they need to make sense of it. If that includes an older reading buddy, a peer reading buddy, three friends on the floor reading it together, or one lone kid in the corner devouring the book, then let it happen. Where there are sharks, there is blood and fresh red flesh. SHARKS does not just talk about the sea creatures and give their stats. 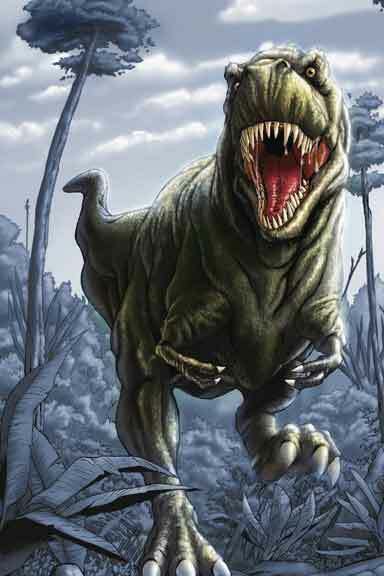 The comic hits ecosystems, food chains and the interdependence of life on other forms of life. It is science-a-plenty in the form of nonfiction literature, which makes it so easy to incorporate into a communication arts lesson. Most state classroom standards require teachers to explore both elements of fiction and nonfiction. SHARKS could make an exciting hybrid lesson plan covering communication arts, science and inquiry-based learning. I would use a Kagan Cooperative group (probably Expert Jigsaw) so that students become experts on their shark, and then learn about other sharks from their peers, add cooperation and socialization to the already dense lesson plan. From this students could study ecosystems in general (websites, library books, comics, etc.) and learn about how living organisms in an ecosystem are interdependent for survival. As a final project, students could apply their knowledge to their local ecosystem with help from a local biologist or Ranger from the Conservation Department, and then come up with solutions to the local ecosystem problems, aquatic or land. The next comic in the series is –– are you ready for this? –– DINOSAURS AND PREHISTORIC PREDATORS. Looking at the cover, I am envisioning another group of kids who will salivate for the chance … to read.